The saying “this is the most important election of our lifetimes” has taken root, and it is the cudgel which older folks bang us millennials over the head with. This saying has spread partially because it’s true, and also because it reflects the relative urgency to vote (and how having it robbed from you is something that millions of Americans deal with each and every day). Respectfully, with the benefit of hindsight, I would argue that the 2000 election was the most important of our lifetimes—as the infinite disasters of the Bush Administration directly inform our present moment—but that doesn’t make this election any less urgent. Democracy really is at stake here. The Republican Party has won exactly one popular vote since 1988, yet has put four justices on the Supreme Court in that span. Most people disapprove of the Republican Party, and millennials largely despise the GOP. A recent CIVIQS poll shows that we prefer Democrats in next month’s election by a whopping 22 points. Millennial women are +33. I mean, this Pew chart from earlier this year basically makes it look like millennial women have forever abandoned the Republican Party. So why are Republicans still in power? Not to shame us, but I have to—it’s partially our fault. If us under-35 folks showed up to vote at the same rate as over-35 folks, Trump wouldn’t be president. That’s just a fact. Young people voting has always been an issue in this country, and our generation is no different. However, there is still time for us to take control of our political destiny. The storyline coming out of the 2018 midterms could and should be the rise of the millennial vote. A recent poll from NowThis/PredictWise said that 80% of millennials are likely to vote. That seems highly implausible, given that per the census, the age group with the highest turnout from 2016 was 65 to 74 year olds at 73%. However, there is another, seemingly more realistic and still encouraging number in this poll that is on par with what other, more well-known pollsters have landed on or around: 56%. That’s the number of millennials who told NowThis/PredictWise that they would “definitely” vote next month. 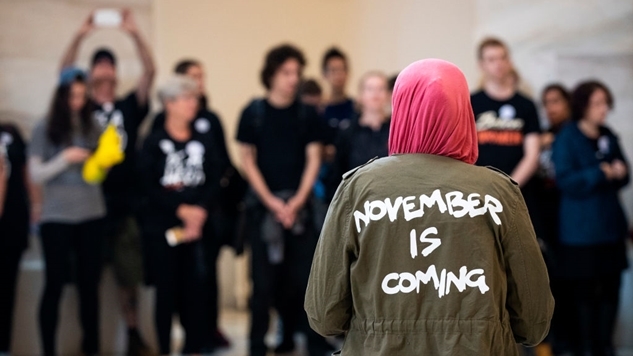 In March, Cosmopolitan and SurveyMonkey polled millennials and found that 48% “definitely” will vote in the midterms. In May, the Associated Press and the University of Chicago found that 56% of millennials were “likely” to vote. An NBC News/Gen Forward survey — taken in late July and early August — found that 55% of millennials will “definitely” or “probably” vote in the midterms. It’s unlikely that all the “probablys” became “definitelys” overnight, but it’s also likely that a poll taken over three months before the election will demonstrate far less enthusiasm than a poll taken three weeks before the election. Somewhere around half of millennials turning out seems to be our likely ceiling based on available polling. Here’s some simple, back-of-the-envelope math using census data in order to demonstrate how powerful a 56% millennial turnout would be, if we had reached that mark in 2016. — In 2016, 43% of 18 to 24-year-old citizens voted. — In 2016, 53% of 25 to 35-year-old citizens voted. — If 56% of 18 to 35-year-old citizens voted in 2016, 4.6 million more votes would have been cast. — If 56% of millennials voted and 53% of them voted for Democrats in 2016 (like they want to in 2018 per the previously linked to CIVIQS poll), Hillary Clinton would have received an additional 2,447,540 votes. — She won the popular vote by 2.8 million. We can swing presidential elections by ourselves, folks, so the midterms should be a piece of cake. If we hit this 56% mark in next month’s midterms, we will force politicians to listen to us come 2020—I promise you that (if we hit 80%, forget incremental gains—start the revolution, we’ve officially taken over). Here’s some more back-of-the-envelope math demonstrating our power in these midterms. I’ll use 2016 population totals, 2014 midterm turnout rates (for everyone but millennials) and CIVIQS’ latest polling of political affiliation broken down by age group to demonstrate how a 56% turnout for the largest generation ever would completely change the geriatric paradigm in politics. — Only 55 to 64-year olds would have a higher percentage of eligible voters show up to vote than 18 to 24-year olds and 25 to 34-year olds. — Using CIVIQS’ figures, Democrats would receive more votes from millennials than any other age group. — If all age groups voted in accordance with CIVIQS’ polling, with 56% millennial turnout, the Democrats would beat the Republicans by 8 points total. — According to FiveThirtyEight’s model, a +8 advantage for the Dems on the generic ballot would translate into roughly a 30 seat advantage in the House. Plus, not only are the population figures I used in those bullet-points a lower estimate of the total size of the millennial generation (since we’ve added a bunch of 16 and 17 year olds from 2016), most polling seems to incorporate something in the neighborhood of this magic number. FiveThirtyEight’s model pegs the Democratic popular vote margin at +8.6 and RealClearPolitics averages the polls to Democrats +7.6 right now. If we millennials simply follow through on our pledge that roughly half of us will vote, the Democrats will likely win the House and then we can begin to fight back with some serious teeth against Trump’s authoritarian government. Now for the bad news: D+8 is still way too close for comfort. Thanks to gerrymandering, the Democrats need to win by at least five points just to narrowly take the House. If we match our dismal turnout rate from the last midterm elections in 2014 (23%), then the generic ballot goes from D+8 to D+5 and all of a sudden, the Republicans are probably slight favorites to keep control of the House. Our generation simply cannot afford to sit this election out. Now, if we can reach that lofty number of 80%? Not only have we made history with a turnout rate that’s damn near unprecedented, but we would completely change the political dynamic in this country overnight, rendering the +10 advantage we would give the Democrats (according to FiveThirtyEight, that margin would lead to a 40 to 50 seat advantage in the House) the second-most important positive development from the 2018 midterms. At 80% turnout, no age group would cast more ballots than us in the midterm elections—which means that come 2020, politicians will be banging down our door to ask us what they can do for us. If 80% of us show up to vote, that’s effectively something like a revolution, and thanks to climate change’s mandate of “fix the Earth in 10 years or it’ll be destroyed in 20,” we need a revolution. Politicians are simple people, they go wherever the money goes and talk to whomever votes the most. The reason our politics are defined by outdated priorities is because the elderly are the biggest group of voters (and donors). Millennials can become the dominant force in American politics simply by doing what most of us say that we intend to do on November 6th (and millennial women, you have the ability to really run up the score on the GOP if you all turn out and vote). Let’s not waste this prime opportunity to take a serious measure of control over our political system. Our future may literally depend on it. P.S. Double check that you’re registered to vote, then make sure that you and your most politically apathetic friends go vote. We all need to band together to take control over our future, lest the over-55 folks determine it for us.